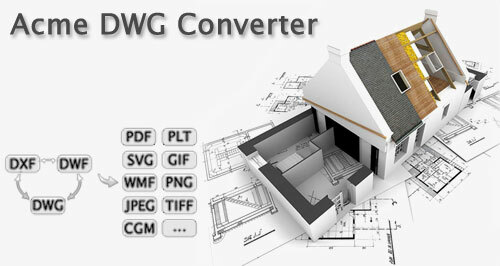 Batch dwg converter that allows you to convert DWG,DXF,DWF to PDF, WMF, JPEG, EPS, SVG, CGM, ... and File version converter without AutoCAD, and also enable the conversion between DXF and DWG file versions (AutoCAD R2.5-R2018). Supports eTransmit command like AutoCAD,and batch recover drawing files. it is also a very nice free DWG Viewer. PDF - Supports DWG to PDF, DXF to PDF, DWF to PDF conversion. SVG - Supports DWG to SVG, DXF to SVG, DWF to SVG conversion. EPS - Supports DWG to EPS, DXF to EPS, DWF to EPS conversion. WMF- Supports DWG to WMF, DXF to WMF, DWF to WMF conversion. CGM- DWG to CGM, DXF to CGM, DWF to CGM Conversion. PLT(HP_GL) - DWG to PLT, DXF to PLT, DWF to PLT Conversion. Recover - Batch recovers DWG, DXF files. Viewer - It is also a Free DWG Viewer.